Microwave is a great invention and now it’s become the part of our everyday life. Nathan Broadbent have taken the Microwave to a completely new level and made it a high end IoT based device. 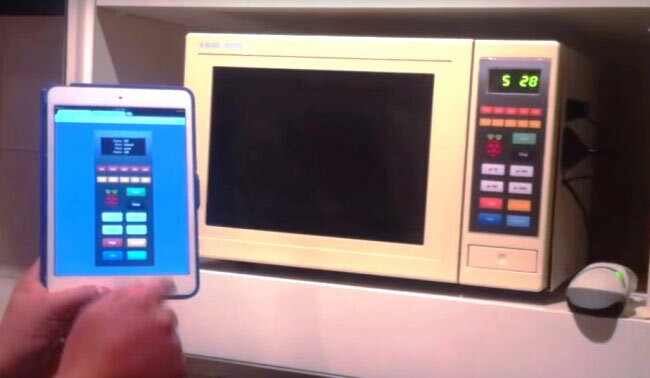 Now you can operate the Microwave with your voice, or with your iPad or even from the Internet. Nathan hacked the Microwave very intelligently, replaced its touch pad circuitry and added some very cool features with beautiful sounds for notifications and alerts. These all intelligent features have been powered by Raspberry Pi at the back end, so it becomes Raspberry Pi Microwave. This Raspberry Pi Microwave can listen to your voice commands and can set the cooking time accordingly, its clock is automatically synced with the Internet and you can have the same touchpad in your phone or computer so that you can control it from your phone. And the coolest feature of this Microwave is this, that you can just scan the bar code of the product being cooked and put it in the Microwave, it will automatically fetch the instructions from the ‘online DB’ and cook it accordingly, you don’t need to set anything. Nathan created a Online Microwave Cooking Database where you can add any product with its cooking instructions and then you just need to scan it with barcode scanner attached to Microwave. Apart from that it can ‘Tweet’ when your food is ready. Nathan really did a great job, he created a new PCB design for his Touchpad circuit and fitted it nicely in the Microwave panel. He also simplified the touchpad interface by removing some rarely used functions and designed a new beautiful Touchpad cover. A USB hub is used to power the Raspberry Pi and other USB devices which has been used in this Microwave like USB powered speaker, USB microphone, Wi-Fi adapter, and barcode scanner. The USB hub is powered by the Microwave power source itself using a power adapter. All the software for this IoT Microwave is running on the Raspberry Pi and can be downloaded from the Nathen’s GitHub account here. Program is written in C language and can be used in Raspberry Pi using the WiringPi library. All the software and other instructions have been explained well by Nathan in his article, like he has used Sinatra app for web interface and PocketSphinx for Voice recognition and created a online database for barcode scanner. Although it’s quite complex to hack and rebuild this Pi Microwave but the results are awesome. Finally Nathan cooked the real Raspberry Pie in the Raspberry Pi Microwave :), check out the Video below.